Segura, who is out of the lineup for Wednesday's game against the Mets, said he expects to miss 3-to-4 days due to the mild hamstring strain he suffered in Tuesday's 14-3 win, Todd Zolecki of MLB.com reports. Segura doesn't believe the hamstring issue will force him to the 10-day injured list, confirming what had been reported earlier Wednesday. 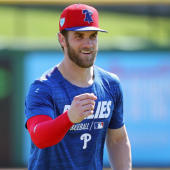 Scott Kingery will draw the start at shortstop in the series finale and seems likely to stick in the lineup at least for games Thursday and Friday in Colorado, and potentially additional contests to follow. If Segura fails to demonstrate meaningful progress in his recovery in baserunning and defensive drills in the next few days, a trip to the injured list may become a more realistic outcome.